There is a fantastic selection of lesbian singles on PinkCupid waiting for you. 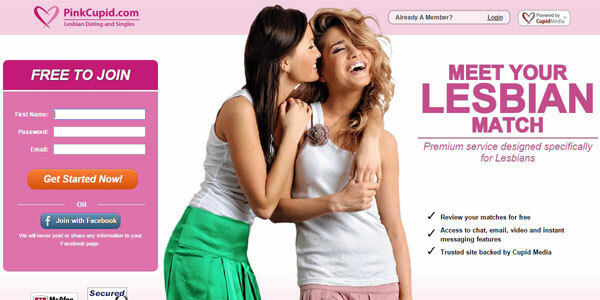 This is a premier lesbian dating site, constructed specifically to help users meet the right woman. And there are plenty of excellent features, including numerous communication and search options which will not only prove invaluable, but also give PinkCupid a valuable edge. The site itself is both eye-catching and extremely well designed, making it simple to find your way around. You will find all the advantages of any top dating site, but at the same type appreciate an experience which is clearly tailor made for lesbian users. There really is plenty to keep you busy, with an impressive range of PinkCupid features. Getting in touch with other users is not only easy, but you can select whichever method is most comfortable for you. In addition to the standard options of private mail and instant message, you can declare your “interest" in another user and inform them immediately. Meanwhile, video mail is a novel way to get in touch and if you want to get to know someone better, then the web chat tool and the active chat rooms are well worth checking out. Searching also goes one step beyond thanks to Cupid Tag. If you want to learn a little more about yourself, then take the personality profiling questionnaire. Finally, PinkCupid’s translation tool underscores the international reach of this impressive platform. Like so many of the top sites such as Zoosk, the sign up process is quick and painless. You will be browsing within just a few minutes. All you need do is to submit your name, password, username and some basic information such as date of birth, location, ethnicity, occupation, etc. This is all in the form of a drop-down box and so takes only a matter of several minutes. Before accessing your personal dashboard, you will be given the chance to upload a photo and to write a few short sentences to describe yourself and to talk about your potential partner. It is worth investing some time in completing these sections, as it will boost the chances of the site calculating a successful automatic match. User safety is taken seriously. For a start, if you find that nuisance users are bothering you, you can block them from your PinkCupid dating site experience entirely. Meanwhile, all communication and transactions are protected by SSL encryption software. Finally, the safety tips will help you date securely both online and offline. You can become a free member and explore the site, create a profile and browse happily. However, your communication tools are limited to sending your “interest" and reading messages. As a result, you will find that pretty much every PinkCupid review recommends becoming a paid member. There are two options: Gold members can use unlimited private messaging, instant messaging and have their profile ranked. A single month will cost $24.98, while a 3-month deal sets you back $16.66 per month and a 6-month package is $8.33 monthly. Meanwhile, Platinum members have all the benefits of Gold membership plus video mail and tools such as translation and adding notes. 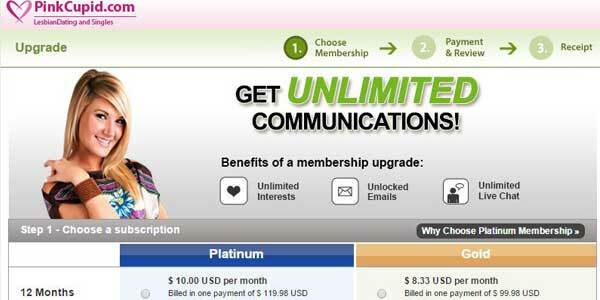 The 1-month deal costs $29.98, 3-months costs $20 monthly and the 6-month deal just $10 monthly. One of the most striking aspects of PinkCupid is that it combines quality with simplicity. As a result, all the tools and sections that you might need are available at the click of a button. The dashboard is well presented and clear. At the top of the page, tabs will take you directly to your inbox, your profile and the search function. Meanwhile, a sidebar conveniently displays useful information such as how many people viewed your profile. One of the simplest and most convenient design features is that you can see when a user was last online just by flicking through a range of profiles. As a result, you can weed out inactive users at a glance. The search engine is perhaps where PinkCupid.com really comes into its own. All the top dating sites such as match.com include a basic search and an advanced search. At PinkCupid, you will find all of this and more. For a start, as every PinkCupid review is likely to mention, you can also use the Cupid Tag. All you need do is pick a tag from the Cupid Cloud which best describes what you are looking for and an appropriate search will ensue. In addition, you can also search via keyword which is also likely to produce a positive result. The basic search includes general classifications such as age and location. The advanced search includes the kind of criteria you would expect, such as religion and physical features. However, PinkCupid also lets you search via sexual role, whether you are looking for someone out of the closet and other important lesbian-focused factors. PinkCupid is less suited to lesbian daters and much more advised for lesbian daters! Essentially, this was designed purely for the purpose of finding the woman of your dreams. With more than 20 million users and search terms which really work, this is a great chance for you to do exactly that. Sites such as Compatible Partners are dedicated to lesbian users, but only those looking for commitment. PinkCupid caters for all lesbians, whether you are looking for no-strings fun or marriage. At the end of the day, if you are a lesbian looking for love, then this is the site for you. PinkCupid offers a great service, some exciting features and good value for money.